AEC Regent ST type bus with silver roof. This type was originally built for the LGOC bus company, which was absorbed into London Transport. The original Victoria Hall. The community hall for the adjacent St. John the Baptist church. It was replaced by an unattractive block of retail premises in the early 1960s. 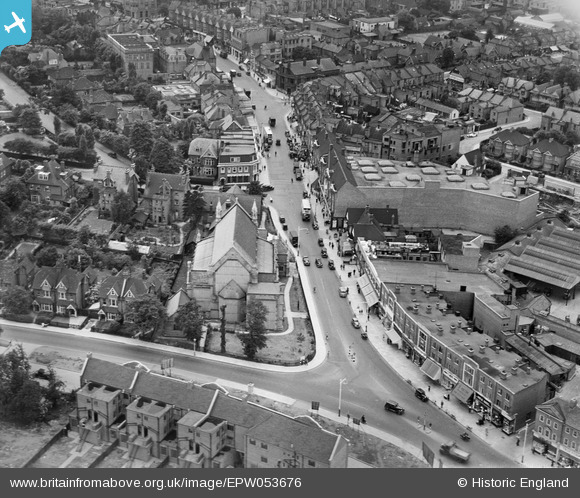 The Victoria Hall was re-sited to a modern building on Sheepcote Road, to the side of the church, replacing the attractive semi-detached villas we can see in the photograph. This, in turn, is being swept away to be replaced by modern housing. Harrow Observer offices and printing works to rear. There was a small factory here in the 1960's called Snomans, where they made work jackets. The building must have gone through several changes of use in its life. I have a friend whose father ran a plastic recycling business there in the 1970s and 80s. He said that it was at one time a dairy (very close to the United Dairies place, so perhaps the stables for the rounds horses). It all went some years ago and public conveniences were built there. These too have already now gone. I believe that the old Havelock building is a smaller building to the right of your marker nearer St Ann's Road and on the other side of the Harrow Observer building. The building you have indicated is the North Thames Gas showroom. The original Havelock pub was a small old fashioned pub that was demolished and rebuilt in about 1960. I take the Lairds comment, I'm inclined to agree with him here. Quite right, it was LLoyd's Bank. Yes, I agree, Lloyds Bank was on this corner. My mother worked there in the seventies. Yes this is the Natwest Bank but at the time the photo was taken this was the Provincial Bank. The 12th June 1937 was a Saturday. I wonder what was attracting all these people out the building with a canopy over its door? I don't know, but the Union Jack on The Popular Stores (Co-Op) in High Street Wealdstone was flying that day too. Sure that would not be common in middle of the war. I grew up in Harrow in the 1950's and I believe this building was the register office so it might have been a wedding! What lovely big houses there were in St John's Road, Lyon Road and Gayton Road at this time. Starting from about 1960 on, Harrow began to go mad and proceeded to tear them down and replace them with stark office blocks and blocks of flats. This was a chain of chinaware shops. Site of soon to be built Granada cinema. Marquis Of Granby pub. Demolished in the 60s to make way for an extension to Sopers department store. Smithy sign, still there today.